Got a dozen questions in the mailbag this week. Good mailbag, I think. As always, send your questions to RABmailbag (at) gmail (dot) com and I’ll get to as many as I can. Don’t take it personally if yours doesn’t get answered. We get a lot of questions each week and can only answer so many. Keep tryin’. Steve asks: While Hicks’ contract is a great deal for the Yankees, this has to be one of the weirder contracts of recent memory, no? The combination of years and salary are just odd. Typically the type of players that get 7 years get way more $$, can you think of any comps? Thanks. It is an unusual structure. It’s a lot of years with a relatively low average annual value, which leads me to believe the Yankees traded extra years for luxury tax savings. The Reds gave Eugenio Suarez a seven-year, $66M extension last year, but he was three years away from free agency, not one year away like Hicks. Those are the only contracts that fit our criteria (5+ years of service time, 7+ years long) with a sub-$20M average annual value over the last ten years. The lowest average annual value is still nearly 40% larger than Hicks’. Crazy. You have to go all the way back to Scott Rolen’s eight-year, $90M contract ($11.25M per year) in 2002 to find a contract that fits our criteria with a lower average annual value than Pedroia’s. So yes, Hicks’ contract is very usual. Contracts this long with an average annual value this low basically never happen. Until now, anyway. Steven asks: Lets say (and pray) that Bird and Voit both have good spring training. Any chance they both make the team, and one of them typically DHs with Stanton moving to left? Aaron Boone has indicated the Yankees won’t carry both Luke Voit and Greg Bird on the Opening Day roster. With a three-man bench, carrying two first base only guys really hurts roster flexibility. Also, given what we’ve seen out of Bird the last two years, there’s a decent chance 35-year-old Brett Gardner is still a better player given his defense and baserunning. I’m not sure there’s anything Bird can do this spring to win a roster spot. I’m really not. He was so bad last year — it wasn’t just bad BABIP luck or something, there was no life in his bat — that I don’t think anything he does this spring will change the team’s mind. Spring Training is full of lies. Don’t trust the numbers. Let Bird go to Triple-A, show he can stay healthy and produce, then figure out a way to get him into the lineup if he responds well. Opening Day is too soon and he’s lost the benefit of the doubt. Doron asks: I dunno why, but I am getting a strong Jose Quintana vibe on Nestor Cortes. What do you think? Steven asks: NYY paid more for DJ LeMahieu (2 yrs/24M) than Twins paid for Marwin Gonzalez (2 yrs/21M). Who you rather have? Gonzalez. He’s a better hitter — Gonzalez will never hit .303/.377/.530 (144 wRC+) like he did in 2017 again, but four times in the last five years he’s been a 100 wRC+ or better player — and a switch-hitter, plus he’s a good defender who is actually versatile and doesn’t have to learn other positions like LeMahieu. The money is essentially a wash and they’re basically the same age, but Gonzalez is a switch-hitter, a better hitter, and more versatile. To me, that makes up for LeMahieu being a Gold Glove second baseman and Gonzalez being merely a solid defender. LeMahieu is fine but I’d rather have Marwin. Keep in mind though, these guys signed a month apart, and you can’t assume Gonzalez would’ve taken the same offer to come to New York. Had the Yankees passed on LeMahieu and continued to wait out the market, it is entirely possible they could’ve wound up with neither guy. In a vacuum, give me Gonzalez. Travis asks: So, apart from wanting the Yankees to have signed either/or Machado and Harper…as Yankees fans, did we get a best case scenario (if Harper signs with Philly) in that neither of them are in the American League (or the AL East) and not on the same team? Pretty close to the best case scenario, I’d say. The best case would’ve been Manny Machado and Bryce Harper going to National League teams with no real shot at contention anytime soon. I guess that means the Marlins? As good as those two are, the Marlins would likely still be a few years away from a postseason (or World Series) appearance even after signing both of them. The Padres are on the rise because of their farm system, though they’re probably a year or two away from really breaking out. The Yankees will see Machado this year (three interleague games) but probably don’t have to worry about facing him in the World Series for a little while. Harper signing with the Phillies definitely puts him in “the Yankees might see him in the World Series this year” territory. This isn’t the absolute best case scenario, but it’s close. Keeping them away from the AL East is the next best thing to signing them. Alessandro asks: Hick’s extension has got me thinking: Who has better long term upside, Florial or Frazier? Who would you rather keep? Estevan Florial has more long-term upside but I’d rather keep Clint Frazier. The best case scenario for both is a bona fide middle of the order masher. Florial is a better defender and a better runner though, plus he plays the more premium position, which is why he has the higher upside. That said, Frazier is about as close to big league ready as it gets. Florial didn’t have a great year in High-A last season — surely the wrist injury had something to do with that — and his pitch recognition is a real problem. If it clicks, forget it, he’ll be a star. The odds of it clicking are small though. Frazier has shown some skills at the big league level and is much closer to reaching his ceiling as a non-switch-hitting version of Nick Swisher than Florial is to reaching his ceiling as … lefty hitting George Springer? Paul asks: How much longer do you think Cashman will be the Yankees GM? He’s awesome, but he’s been around forever. At some point you have to think either he’ll retire or not get renewed. Brian Cashman is the longest tenured general manager in baseball and it is not close. He was named GM in February 1998. Rangers GM Jon Daniels is the second longest tenured GM. He was hired in October 2005. (Billy Beane was promoted to president of baseball operations in 2015.) I’ve given up trying to guess when Cashman will no longer be the GM, either because he gets promoted or leaves the organization. I thought he might leave when his contract was up during the 2004-05 offseason and the Phillies reportedly chased him hard. I thought he would get promoted to president of baseball operations (or something along those lines) during the 2014-15 offseason, with Billy Eppler taking over as GM, but nope. Cashman signed a new five-year contract last offseason, so he’s not going anywhere anytime soon, not unless something crazy happens and the Yankees collapse. Twenty years is an eternity for a GM in any sport but there are no indications Cashman’s time will be up soon. He is very loyal to the Yankees — they are literally the only employer he’s had in his adult life — so my guess is when the time comes and Cashman is no longer the GM, it’s because he transitions into another role with the organization. Rob asks: Hey Mike, do you see MLB ever expanding to four divisions of four (north, south, east, west alignment), removing the unbalanced schedule, and going back to the four best teams in the playoffs? Yes to expansion and four divisions, maybe to eliminating the unbalanced schedule, no to four teams in the postseason. The Wild Card Game is too successful (i.e. a moneymaker for MLB) for me to think it’s going away. Maybe they’ll turn it into a best-of-three series at some point, but I don’t think we’re going back to four teams in the postseason. More teams in the postseason equals more revenue and that’s the entire point. MLB is only adding postseason spots from here on out. Not taking them away. Expansion is inevitable. I don’t know if it’s five years away or ten years away or 50 years away, but it is coming. Two new teams equals two 16-team leagues and four four-team divisions. I guess the four division winners and the best non-division winner go to the postseason each year? The worst division winner and the fifth team play the Wild Card Game? I dunno. Interleague play isn’t going anywhere and balancing the schedule with 32 teams and a 162-game season probably doesn’t work. They’d have to shorten the schedule, which the MLBPA is pushing for anyway. Brandon asks: In light of the Aaron Hicks extension, I figured this would be a good time to ask. Which trade was the bigger steal: Swisher for Wilson Betemit or Hicks for John Ryan Murphy? Hicks is awesome but it has to be Nick Swisher. The extension and the trade are two separate entities, and the Yankees gave up nothing in both trades, so that isn’t a factor. The Yankees acquired four years of Hicks and, at best, he will give then three above-average seasons. The Yankees acquired four years of Swisher and he gave them four above-average seasons. To put it another way, Swisher was at +14.2 WAR in his four seasons in pinstripes. Hicks is at +8.0 WAR in three years. Does he have a +6.2 WAR season in him in 2019? It is definitely possible. Right now though, I lean Swisher because he was very good all four years with the Yankees. Hicks had the dud year in 2016. Both were phenomenal trades. The Swisher, Hicks, and Didi Gregorius trades were massive wins that, individually, would headline the resume for many other general managers. Cashman and the Yankees made all three trades in the span of seven years. Pretty amazing. Anonymous asks: I’m a huge Dellin Betances fan & felt he should have made the all-star team in 2018. Where do you rank him amongst the Yankee relievers? Dellin has at least one more year to go with the Yankees and hopefully many more after that. By the end of a hypothetical three-year extension, Betances could very well be the clear cut third best reliever in team history behind Rivera and Righetti, and at that point, he might be closing in on Righetti as well. Update: I included Righetti’s time as a starter in the list above like the dope I am. He was at +12.7 WAR (+1.2 WAR per 60 IP) as a reliever. So I guess that makes the argument Betances is one of the top three relievers in team history even stronger. Lawrence asks: In your column on Wednesday, you stated that Betances’s feat of striking out at least one batter in 44 straight appearances was the longest such streak in American League history. You didn’t qualify that as just a record for relievers. Hard to believe that Ryan, or Clemens or Johnson (Randy or Walter) never went 44 straight with at least one strikeout. How far did they go? And who has the National League record? Another reliever? Cole Hamels is ninth with 332 straight starts with a strikeout and that’s the longest active streak. Clayton Kershaw (316 starts) and Gio Gonzalez (307 starts) are both working on active streaks longer than 300 starts and David Price (289 starts) and CC Sabathia (283 starts) are both closing in on 300 consecutive starts with a strikeout. If we look at all pitching appearances, not just starts, Ryan’s 382-game streak is the longest in history. At some point during his 411-start streak Seaver made a relief appearance and failed to strike out a batter. Jeremy asks: What is the reasoning behind not televising all Spring Training games? Sure, viewership will be far lower than a regular season game but I have to imagine ratings would be higher than a Centerstage rerun or whatever YES will air during that time. It’s all about cost. At some point the cost of broadcasting games (paying the broadcasters and crew, covering their travel and lodging, etc.) outweighs how much money those broadcasts bring in. The network does the math, says profits are maximized at X number of broadcasts, so that’s how many games they broadcast. That’s all it is. Every network has scaled back on spring broadcasts in recent years but the YES Network still shows more than most. They’re broadcasting 12 games this spring, all at home in Tampa so the crew and equipment doesn’t have to move around. Fortunately other networks usually broadcast games when their team plays the Yankees because the Yankees equal ratings, so we get a lot of road broadcasts on MLB.tv and MLB Network. Other fans aren’t so lucky. There are ten questions in the mailbag this week. The Grapefruit League season begins tomorrow and that means we can start mailbaggin’ about actual baseball again. Hooray for that. Anyway, send your mailbag questions to RABmailbag (at) gmail (dot) com. Hah, interesting! That would be something. I don’t think this was a factor in the LeMahieu signing at all though. He and Arenado are very different hitters. LeMahieu is an opposite field singles hitter who hits a lot of ground balls. Arenado is one of the most extreme fly ball hitters in baseball (career 37.0% grounders) who mostly pulls the ball, though can poke it over the fence the other way. This would be like signing Derek Jeter to gain insight into how Gary Sanchez plays outside Yankee Stadium. If anything, Troy Tulowitzki is a better “live research” subject for Arenado because he is — or was at his peak with the Rockies — a fly ball guy with pull tendencies. I have no idea what sort of player Tulowitzki will be at this point of his career, but, if he’s still getting the ball in the air to left field, it’ll potentially tell us more regarding Arenado than LeMahieu serving singles to right. The Yankees signed LeMahieu because they love his glove and think there’s some upside in the bat. That’s all. Geoff asks: I find it surprising that you rarely see a lefty starter prospect on the NYY top prospect list, and equally surprising that it is rarely if ever never discussed considering where the team plays it’s home games. It’s been this way for years; Sheffield and Clarkin were rarities. It is unusual. I don’t think the Yankees (or any team, for that matter) focuses on handedness with prospects. They grab the best talent, try to develop it, and go from there. You’re doing yourself a disservice if you pick and choose prospects to draft or sign based on the hand they throw with or the side of the plate they hit from. Just get the best possible players. That said, you’d think the Yankees would run into more good lefties than they have over the last 15-20 years through sheer random chance. It’s been Manny Banuelos, Justus Sheffield, and Ian Clarkin. That’s it. I suppose we could throw Jordan Montgomery into the mix but he was never a top 100 prospect type. This isn’t anything to worry about. Not with the Yankees turning into a player development machine. It’s just an oddity. John asks: I was surprised to see Taylor Widener appear as #83 on MLB 2019 Prospect list, and you have him so low (#28) on the “what if we didn’t trade them” prospect list. Has something changed since he went to Arizona he is now viewed so highly? Yeah, I don’t get it either. MLB.com is the only site with Widener in their top 100 list. Seems to me they are heavily weighing his performance, which was great last year. Threw 137.1 innings, all in Double-A, with a 2.75 ERA (2.99 FIP) and very good strikeout (31.9%) and walk (7.9%) rates. Lefties hit him more than you’d like (.232/.301/.405) and MLB.com’s report even notes some “forecast an eventual move to the bullpen.” Fastball/slider righties who lack a weapon to neutralize lefties and might be facing a future in the bullpen are everywhere. Is there a meaningful difference between Widener and Trevor Stephan, for example? Widener is a good prospect but MLB.com’s ranking is an outlier. They have to be putting a lot of stock into the performance, and hey, that’s fine. There’s no right way to rank prospects. Alberto asks: Lets say for some reason the Yankees are no longer an MLB team, meaning no baseball from the Bronx. Would you stop following baseball or who would follow or think could follow? Definitely wouldn’t stop following baseball. There’s no chance that happens. I don’t think I would latch onto another team. My routine right now is, when I’m not watching the Yankees, I watch whatever game or team around the league interests me at that point in time. Last year I watched a ton of Angels games because of Mike Trout and Shohei Ohtani. I also found myself watching the A’s a bunch because they were a fun group. It worked out nicely because the A’s and Angels are on the West Coast, so I could flip over once the Yankees finished their game and still catch all nine innings. With no Yankees, I’d just be a fan of baseball rather than latch on and become a fan of another team. Joe asks: Does Dallas Keuchel on a one year deal make sense? Tanaka and CC probably both prefer extra rest. Absolutely. Keuchel on a long-term contract scares me but I’d take him on a one-year contract no questions asked, and figure out how the rotation works later. You know someone will get hurt and the “six starters for five rotation spots” thing will take care of itself. Give Keuchel one year and $35M for all I care. I don’t think the Yankees are open to another high-priced addition at this point, short or long-term, and I don’t think Keuchel will have to settle for a one-year contract either. I could see him getting something similar to Jake Arrieta’s contract. Two guaranteed years with a player option and one of those funky multi-year club options. Keuchel’s definitely not going to get Patrick Corbin or Yu Darvish money. Never was. I expect him to still get multiple years though. Matthew asks: Do you foresee teams faking injuries to get around the 3 batter rule? Who’s to say the guy’s arm didn’t get sore? Football teams fake injuries to slow down no huddle offenses (for example) and there’s not much anyone can do about it other than a public shaming by the opposing coach in the press conference. I guess MLB would go with the honor system? I don’t know what the plan is here. Requiring a pitcher who leaves with an injury before facing three batters to automatically be placed on the injured list is unreasonable. All throughout the season we see pitchers removed from games as a precaution, then a day or two later they’re fine. You can’t ask a pitcher who maybe has an ache or some tightness to gut it out for another batter or two to avoid the required injured list stint. I suppose MLB could put someone at each ballpark who confirms the injury, but even that doesn’t seem fullproof. I’m not sure what the solution is here. I guess MLB could just run with it, and if they think injury removals are being abused, they could circle back and find a solution. Make sure it’s actually a problem before coming up with a solution, basically. Rubaiyat asks: Do you have to play ten full seasons to earn a pension, or could you play nine full and a few months in the tenth season to get it? Also, with most players not being able to play 10 years to earn a full pension, do you see the CBA pushing for a lower amount of years needed to earn one? Ten full years of service time locks in the full pension. It doesn’t have to be ten consecutive years, just ten years. You can be a journeyman who splits parts of 16 seasons between Triple-A and MLB, and as long as you get to ten full years of service time, you lock in the full pension. The full pension is north of $200,000 annually these days. Players can begin receiving that at age 62. (They could also tap into a smaller pension at a younger age.) The important number for most players: 43. Forty-three days of service time locks in a $34,000 per year pension. The more service time you accrue, the larger the pension until you max out at ten years. For up-and-down guys who have no real shot at ten years in the big leagues, those cups of coffee and September call-ups are important. Every little bit of service time increases the player’s pension. The current service time requirements have been in place for decades and they’re set by the MLBPA. The tricky part is funding the pension plan if the service time requirements are lowered. The pension plan is funded by the players, the teams, and MLB itself. They’d have to get everyone on board and convince them to pay more into the fund to make this work, and good luck with that. Chris asks: Doesn’t the Machado deal wreak of Robbie Cano’s similar mistake of taking the money instead of the wins? First of all, this isn’t a good comparison because Robinson Cano already had a World Series ring when he became a free agent. Win a ring, then get paid. What’s so wrong with that? Secondly, why is it a mistake to chase money instead of wins? Had Machado signed with a no doubt World Series contender (like the Yankees!) the critics would just say he’s taking the easy way out. He doesn’t want to be The Man so he’s going to a team with other great players, blah blah blah yadda yadda yadda. And third, given their incredible farm system and apparent willingness to spend, couldn’t you argue only a handful of teams are better set up for success the next six or seven years than the Padres? The Chargers are gone. San Diego has one-team city now and the Padres are going after it hard. Good for them. I will never ever ever blame a player for chasing the money. You’re never going to make everyone happy so don’t even bother trying. Just do what’s best for you. Steve asks: In retrospect, do you think the Yankees receive good value on the Mark Teixeira free-agent deal? I do. Teixeira hit .248/.343/.479 (120 wRC+) with 206 home runs and +17.8 WAR during his eight-year contract. He had one MVP caliber season (2009) and helped the Yankees to a championship as well. Straight $/WAR says Teixeira provided $110.8M in value on a $180M contract, so in that sense it was a bad deal, but $/WAR is overly simplistic. The cost of a win is not linear and it is not the same for every team. Using the same $/WAR calculation for the Yankees as the Rays or White Sox makes no sense. The Yankees were a contending team every year from 2009-16. They didn’t always make the postseason but they tried. The goal going into each season was to make the postseason and win the World Series. Every additional win they added to the roster increased their chances of achieving that goal. This wasn’t a 75-win team getting to 78 wins. It was an 88-win team getting to 91 wins, or a 92-win team getting to 95 wins. Those extra wins are huge at that point on the win curve, and since the Yankees’ brand is built on winning, they should be (and historically have been) willing to pay extra for those wins. They did with Teixeira. Casey asks: What are the chances the Yankees didn’t go after Harper to get Trout when he is a free agent? Still could extend Hicks after this season and when Trout is available sign him to play Center and slide Hicks to a corner outfield and still have Judge and Stanton to rotate between the 3 outfield and DH spots. Small. It’s not smart to plan around players who won’t become free agents for another few years. Lots can change between now and then. Trout’s performance could collapse or (more likely) the Angels could give him a massive lifetime contract. I am much less confident in Trout reaching free agency than I was Manny Machado and Bryce Harper two years ago. Those two always seemed like good bets to test the open market. I’m not sure about Trout. Also, waiting for Trout doesn’t help now. The Yankees should be focused on improving the 2019 Yankees, not waiting around to improve the 2021 Yankees. There are two possible championships to be won between now and then! If Trout becomes a free agent in two years and he is still Mike effin’ Trout, I will be very loud and make it very clear I want the Yankees to sign him. That said, under no circumstances should the Yankees pass on opportunities to improve now with an eye on Trout later. There are too many variables at play. Besides, how are the Yankees going to pay Trout when they have to pay their core? I’m pinch-hitting for Mike again, and I have thirteen questions to work with. As always, you can send your questions to RABmailbag (at) gmail (dot) com and we’ll get to as many as we can each week. Steve asks: The Players Association is floating the idea of having less team control in the next CBA. I think owners would welcome the chance to determine what they want to pay rather than have an arbitrator decide for them especially given the recent weak free agent markets. Do players fare better in their last year of arbitration than they do as free agents in recent years? It kind of remains to be seen, doesn’t it? Bryce Harper ($21.625 MM) and Manny Machado ($16 MM) should be locks to do better in free agency than they did last year, but it remains to be seen if that’ll happen. If I had to guess, I still think they’ll both do better – but I’m less confident about Harper besting last year’s salary than I was even a few weeks ago. Last off-season, the top-tier free agents almost unanimously bested their salaries from their final year of arbitration eligibility. J.D Martinez, Eric Hosmer, and Jake Arrieta all fared significantly better in terms of AAV, as did Alex Cobb and Zack Cozart (albeit with much less money overall). The lone exception is Mike Moustakas, who ended up taking a $3.2 MM paycut in re-signing with the Royals on March 10. Patrick Corbin made $7.5 MM in 2018, and his new contract will pay him an AAV of $23.333 MM over the next six years. Nathan Eovaldi is something of a unique case, given his injuries, but he did well, too, jumping from $2 MM last year to $17 MM per season through 2022. A.J. Pollock made $7.75 MM last year, and will earn a minimum of $13.75 MM per year for the next four years. Andrew McCutchen is coming off of a team-friendly contract extension, and will earn about $2 MM more per year. Zack Britton received a $1 MMish raise over the next three years. J.A. Happ received a $4 MMish raise over his previous free agent contract. It has unfolded in a similar manner – lest we forget that Jake Arrieta didn’t sign until March last year – which sees players getting raises, but only the upper-echelon players receiving significantly more. However, the mid-level free agents have been squeezed in back-to-back off-seasons now; and it isn’t just traditional free agents. Over the past two off-seasons, we have seen Mike Fiers (121 ERA+ in 172.0 IP), Matt Adams (115 OPS+ in 367 PA), Jared Hughes (146 ERA+ in 59.2 IP), Derek Dietrich (112 OPS+ in 551 PA), Wilmer Flores (107 OPS+ in 429 PA), and Blake Parker (128 OPS+ in 66.1 IP) non-tendered coming off of solid seasons, despite relatively minuscule arbitration figures. And those of them that did end up signing ended up receiving less than their estimated arbitration figures; it’s a disconcerting trend, to say the least. The short version of this long-winded nonsense is that most players that go from their final year of arbitration eligibility to free agency tend to get a pay raise, though it’s often comparatively modest. Bob asks: Great job on the Prospect List! I noticed that many of the power arms have command, control or third pitch issues and may be headed for future relief roles. Hitting generally can be taught (i.e. launch angle, backspin, plate discipline) and improved through at-bats. Is it more difficult to teach command, etc.? While relievers are valuable, guys who can go through the lineup 2-3 times are more valuable. Wouldn’t a focus on command and multiple pitches rather than selecting big kids who can throw a ball through a brick wall garner more starting pitchers? It is an almost universally-held belief that command is the most difficult thing to teach a baseball player. It’s not just a matter of teaching a pitcher how to locate; it involves overhauling mechanics, changing speeds, accounting for the movement in one’s pitches, and the like. It’s something that pitching coaches try to work on at every level, but it’s incredibly difficult to do. I base this on nothing by my own observations and anecdotal evidence, but it seems like experience is the only thing that can truly teach command. Randy Johnson was pushing 30 when he harnessed his control, and the command came shortly thereafter. Bartolo Colon didn’t become an artist at the corners until he was in his 30s, either. It’s not all that uncommon to see that sort of thing click as a pitcher learns his craft at the highest level – but that’s not really an answer, either. David asks (short version): The proposed three batter rule will have a significant effect on teams like the Yankees that like to have a defined inning for each reliever. Under the current system, assume Sevy goes 7.1 innings before tiring or reaching his maximum pitch count. Assuming the score is close, the Yankees would go to Dellin for the last two outs of the 8th. They would then go to Chapman in the 9th. Under the new rule, if Dellin faced 2 batters and got 2 outs, they couldn’t go to Chapman in the 9th because Dellin didn’t face his third required batter. 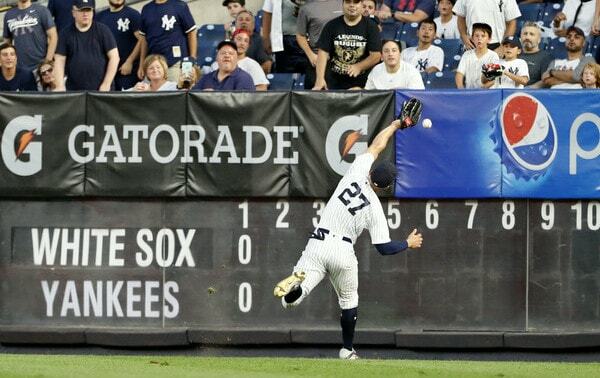 Don’t you think this qualifies as a huge impact on the Yankees? This is actually a common misconception that I’ve been seeing all over Twitter and other blogs. The three-batter minimum, as per ESPN’s Jeff Passan, “[t]he rule would apply to all pitchers, except in instances in which pitchers finish an inning or are injured, sources said.” Therefore, in this particular situation Betances would be free and clear after those two outs. Rob asks: Why do you think the yankees were willing to pull the trigger on Stanton (a weak defensive outfielder they didn’t really need) instead of waiting for Machado (gold glove 3B they need) for a very similar AAV? Stanton isn’t – or wasn’t – a bad defensive outfielder. UZR/150 has him as 5.1 runs above-average in right for his career, and DRS/150 has him at roughly 7.0 runs saved per year. And that’s in 8590 inning out there, so it’s a very compelling sample size. He looked bad at times in left last year, to be sure, but he was learning a new position in a new park with a new team, so I’d hazard that his struggles are understandable. I also don’t think it’s quite fair to say that the Yankees didn’t really need him. They had a void at DH, and he was the reigning (and deserving) NL MVP. Stanton was certainly something of a luxury – but can’t you say the same thing about Machado now, given how well Miguel Andujar played last year? Machado’s a big upgrade, but so was Stanton over Jacoby Ellsbury or whoever else they would’ve trotted out to DH. And the AAV isn’t necessarily similar. Stanton’s luxury tax hit for the Yankees is around $22 MM for the entirety of his deal, due to the money chipped-in by the Marlins. We don’t yet know what Machado will earn, so it’s difficult to make a comparison – but most folk felt that he was a lock for $30 MM+. Now, as to the why of all of this: I don’t know that they go hand-in-hand. The Yankees, despite whatever statements to the contrary, have the money to sign Machado. The issue is that they’re functioning on self-imposed austerity. More to the point, though, Stanton was available last off-season for scraps, and he made a great deal of sense at the time. Without Stanton, do they break 100 wins and make it to the ALCS last year? Probably not. Frank asks: I was looking over the PECOTA projections and 3 things struck me as odd. Are any of those projections really valid based on each player’s history? LeMahieu stands out the most to me, as PECOTA projects him to slash .290/.358/.417 in 594 PA, which is superior to what he did last year in fewer plate appearances … and he posted 4.2 WARP in 2018. The issue, however, seems to be entirely tied to defense: he had 20.1 FRAA last year, and they’re projecting 6.2 FRAA in 2019. Is that fair? Maybe. FRAA had him as a scratch defender from 2013 through 2016, so it’s not shocking to see quite a bit of regression there – especially when they also forecast him bouncing between three positions. Voit’s defense is interesting, because the metrics are all over the place. FRAA, DRS, and UZR loved him in 186 innings in 2017, and hated him in 287 innings lat year. The eye test isn’t friendly, though, so I think that it’s likely that he is a negative defender at first. But, given the small sample sizes, I don’t really have a strong opinion on this. And FRAA had Hicks at -8.6 last year, so they actually have him improving a bit. This one I just straight-up don’t buy, though. It doesn’t jibe with the eye test, and DRS and UZR both had him as average last year (and well above-average before that). Rex asks: A die-hard Yankee fan since 1955, I’ve always used batting average,rbi’s, and home runs to gauge a players production. I lose interest in a story when terms like WAR,BABIP, and other analytics are used…simply because I don’t understand them…and I would bet the grocery money that I am not alone in this! Would you please publish a list of these terms, and a short summary on why we should give a damn about them. I was in broadcast news 35 years and learned I should not assume that my audience knew what I knew about a topic. We do have a glossary of the statistics that are frequently used around these parts, which you can find here. Paul asks: Do you think teams may be waiting for spring training to sign free agents since they can move their injured players to the 60-day IL instead of having to DFA Fringe 40-man players? I hadn’t considered this until reading this e-mail, but it wouldn’t surprise me if we see a mild flurry of activity once the 60-day injured list opens for business. Flurry may be too strong a word, considering that there may not be all that many players that will hit the injured list – but, given the preciousness of 40-man roster spots, it could help out some of the lower-level free agents that are looking for a gig with a real shot at playing time. Mike asks: I’m just trying to find a positive in the Yankees not signing Harper. Do you think they’re passing so they can sign Trout instead? Sure. And then they’ll pass on him to sign Francisco Lindor the next off-season. And then they’ll pass on Lindor to sign Alex Bregman the following year. Any claims that the Yankees are passing on ‘x’ now to sign ‘y’ later are disingenuous at best; or, if it’s a legitimate strategy, foolish. Counting on players to retain their skill level, stay healthy, and not sign an extension is a recipe for disaster – especially when it comes at the cost of a better chance of winning now. John asks: The farm system rankings are confusing me. Experts are ranking the Yankees system in the bottom half of the league (19 by Law and you agreed on your chat). However from reading you and those same other sources, very few teams have this many uber talented 17-19 year old players. Even Keith Law says that players like Pereira are poised to jump into the top 100 this year. No one would be surprised if Cabello (still don’t get how people compare him to Vlad and Soto and don’t rate him higher), Pereira, Deivi, Freicer Perez, Roansy Contreras, Seigler, and a bunch more prospects shot up prospect lists. Most teams would rather have star potential then a bunch of solid players. Granted most will miss but there are so many talented young players, that some will break out. I don’t expect the Yankees to have a top 10 system with only 2 or 3 top 100 prospects, but I find it hard to believe there are 18 other baseball systems that I would rather have then the Yankees. Am I missing something? Is there a hell of a lot of talent here? Absolutely. But eight of those guys are pretty far from the majors, and one of the two that’s knocking on the door has never been healthy for a full season. That makes for what might just be the highest-risk, highest-reward farm system around – but the beta is tremendous. Adam asks: 12-ptch roster limit. I, too, am not in favor of this proposed rule change. Assuming this winds up getting approved, do you think there’s a way to game the system i.e., label a pitcher as a “position player” under the pretense of using him as a bench bat and then subsequently bring that “position player” in as a pitcher? After all, position players do pitch here and then. Or would MLB just deem this to be blatant circumvention of the rule? There’s no way MLB would let this fly. I’m assuming that the team will have to name their pitchers in advance of the game (or whenever they adjust their roster), and only those designated as pitchers will be able to head to the mound. The wrinkle, of course, is someone like Shohei Ohtani, who might require the changes to the roster to be game-by-game. Tim asks: The question I’ve been asking myself during the whole Machado/Harper discussion is this: how great is the incremental improvement to the team from one superstar, versus the opportunity cost of spending the money in the future when a more dire need is evident. It’s clear that the team is now adhering to a budget of sorts. Who doesn’t want a superstar, but if the choice is to sign Machado now and have the offense get marginally better (ok, and the defense much better), or be able to trade for a couple of key players in July because of injuries, I know which way I’d go. Same thing for signing free agents next winter and all the future off seasons. I’d rather the money was spent on a CC replacement, not improving the offense. Does that make sense or am I ignorant on some of the financial implications? What you’re saying definitely makes sense, there’s just a great deal of nuance in there. Signing a player now gives you that added value for the entirety of the season. The difference between (hypothetically) the current set-up – Andujar at 3B, Gardner in LF, and Stanton at DH – and a Machado-based set-up – Machado at 3B, Stanton in LF, Andujar at DH, and Gardner as the fourth outfielder – adds a ton of value throughout the season. You’re essentially replacing Gardner with Machado in this instance, while also improving the bench. I do agree that I would’ve rather spent money on a larger rotation upgrade than Happ, but the Yankees balked at Corbin’s price tag, and there wasn’t really a better option at that point. There’s always an opportunity cost to passing on someone or waiting to see who becomes available, and they have paid some semblance of a price as a result. And, for whatever it’s worth, I’m not sure that I loved Corbin at that price, either. You also have to make the best of whatever is available. Would a rotation upgrade be better? Perhaps. But when there’s generational talent available on the position player side of things, adding two or three wins there instead of overpaying for a marginal rotation upgrade makes sense. And, getting to the core of your question, I don’t like putting off something today on the off-chance that you can get something better tomorrow. Putting the best possible product on the field on Opening Day inherently has more value than waiting for a weakness to develop and tackling it in-season. The costs will be higher, and that’s assuming that there’s a solution on the market. Besides, signing Machado or Harper now shouldn’t mean that they can’t trade for a reliever or fifth starter on July 31 – they just cost money, after all. Their budget is another wrinkle altogether. But we can’t anticipate what their needs might be in July, and waiting to see what happens seems like a recipe for disaster. Austin asks: How many first round picks have really panned out? I completely agree that the system is broken, and needs to be corrected in many ways, but how many first rounders really have a good career? I can’t imagine its that many. It’s really hard to play in the major league. The numbers probably say he doesn’t have a good chance. Kyler Murray was the 9th overall pick. As per Baseball-Reference, 34 of the 54 9th overall picks reached the majors, and combined to produce 269.3 WAR (or 7.9 per big leaguer). And that list includes several quality players, including Javier Baez, Kevin Appier, Barry Zito, Geoff Jenkins, Mark Kotsay, Ron Darling, John Danks, and Michael Cuddyer. Appier was the only truly great player on that list (though, Baez appears to be on his way), but that’s not an insignificant number of solid major leaguers. And that’s just from the slot in which Murray was drafted. That’s a ten-year sample wherein roughly 67% of first-rounders reached the big leagues, and produced an average of 8.9 WAR. That may not sound like much, but there are diminishing returns with each and every round. Moreover, 8.9 WAR really isn’t a bad mark for one’s career. And while that may not mean that a player is a lock to reach the show or be much more than a bench player or reliever when they get there, that group nevertheless has he best chance of reaching those not-so-lofty heights. Bill asks: There’s been talk of Collusion between owners, i know it’s almost impossible to prove BUT if it was proven that the owners colluded to drive down FA prices, what could the consequences possibly be for them? The owners have been found guilty of collusion three times before, all in the 1980s. They ended up settling those suits and paying the MLBPA a $280 MM settlement, which the union decided how to distribute to its members. Players that had signed below-market deals were also allowed to field new contract offers in some cases (though that was fairly limited), without having to lose their current deal. I suspect that we’d see something similar this time around – albeit with a much larger dollar figure. Eleven questions in this week’s mailbag. One for each degree of temperature outside. Remember to send your questions to RABmailbag (at) gmail (dot) com and I’ll answer as many as I can each week. Danny asks: Who is your favorite low-cost, one year starter left on the market? Liriano? Anderson? Shields? I looked at Shields’ numbers just for kicks and couldn’t believe he threw over 200 innings last year. Francisco Liriano above all. He has experience starting and relieving, and has moved seamlessly between those roles the last few years. Liriano still misses bats and gets grounders. Not like he did during his prime, but enough to be a serviceable swingman at this point in his career. If not for the regime change this offseason, I’d say James Shields was ticketed for the Orioles. He seems like their type. Brett Anderson is never healthy. Signing him always sounds like a great idea until you actually sign him and he spends four months on the disabled list. Gio Gonzalez seems likely to get starting job somewhere rather than settle for a swingman role for the Yankees. I’d rank the veteran one-year free agents like so: Liriano, Gonzalez, Shields, Anderson. Ervin Santana has said he hates pitching in Yankee Stadium, so forget him, and Jeremy Hellickson and Clay Buchholz are great big mehs. Liriano’s my pick. He has the versatility, strikeouts, and grounders I want for that swingman/sixth starter role. Keith asks: Good problem to have hypothetical: Let’s say that Tulo actually stays healthy and, come mid-season, is producing in the field and at the plate. 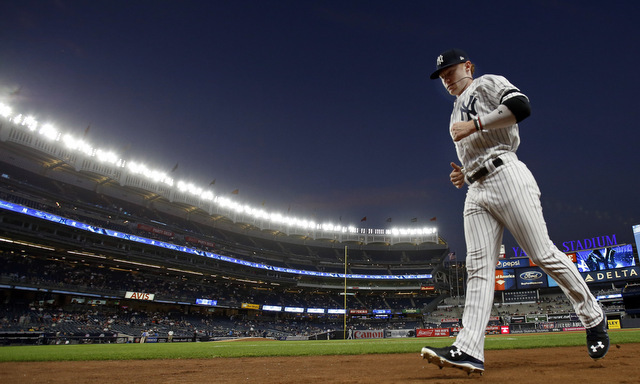 Clint Frazier is mashing at AAA, forcing the issue as hoped, and Didi is due to return. With a 3 man bench, we can’t carry Gardner, Tulo, LeMahieu, and Romine. What do the Yankees do? Leave Clint languishing? Cut Gardner? Cut/trade Tulo? In that case, the Yankees should dump the eighth reliever and go with a four-man bench. Put Didi Gregorius back at short and Clint Frazier in left, and move Troy Tulowitzki and Brett Gardner to the bench, where they’d join DJ LeMahieu and Austin Romine. Rotate guys in and out to keep everyone productive and involved. Enjoy the depth. If the Yankees must have an eight-man bullpen, I guess keeping Frazier in Triple-A is the easy solution, but I don’t like it. This is definitely one of those things that will work itself out. I am 100% certain the Yankees would welcome this “problem” at midseason. Ralph indeed: The NY Post recently featured an article with all the writers providing their top 10 Yankees of all time in concert with the HOF voting. I was shocked to see that Thurman Munson was not listed on any ballot as an all time top 10 Yankee. Do you agree with this summation? My heart is outraged, but we think with our heads, so please provide some perspective. Thanks. Here is that article. Six writers listed their personal top tens and 15 different players were mentioned. Munson was not one of the 15. Had Munson’s life and career not been tragically cut short — he died less than two months after his 32nd birthday — he stood a great chance of going down as a top ten Yankee all-time. The 1970s were the golden age for catchers (Johnny Bench, Ted Simmons, Gary Carter, Carlton Fisk, etc.) and Munson was right there with those guys. Rookie of the Year in 1970, MVP in 1976, World Series rings in 1977 and 1978, captain of the team, so on and so forth. I’m big on great catchers. I love ’em. Munson was before my time, but I reckon he would’ve gone down as my all-time favorite player given everything I’ve read and heard. On the WAR list, Munson is still behind guys like Ford, Pettitte, Ron Guidry, and Bernie Williams. He’s right there with Robinson Cano (+45.5 WAR). Like I said, I dig great catchers, and I think I would’ve had Munson in the 11-13 range somewhere with Pettitte and Bernie on my list. I am surprised none of the six New York Post scribes squeezed him into their personal ton ten Yankees list. Leaving him out is not egregious though. Munson was great, but the Yankees have had so many great players. Guys like Pettitte and Bernie would be slam dunk top tens for most other teams. Michael asks: Just read a couple of articles about the Yankee farm system and its prospects. Miguel Andujar wasn’t mentioned anywhere in any of them. What was Miggy’s background and how did he rise to the majors? How come everyone mentions Gleyber but no one mentions Miggy. What’s the deal here? Not sure what I was thinking dropping Andujar from No. 7 in 2015 to No. 15 in 2016. Huh. Anyway, Andujar had a breakout year in 2016, hitting .271/.331/.403 (108 wRC+) with a career high 12 homers between High-A and Double-A. Then, in 2017, he hit .318/.364/.503 (135 wRC+) with 16 homers between Double-A and Triple-A, and started to get some top 100 prospect love. Andujar never got as much attention as someone like Gleyber Torres because there were always questions about his defense, and also because it wasn’t clear how much power he’d have long-term. For a long time he looked like a line drive guy who might top out at 15-20 homers, which is good, but not top prospect good. Fast forward to last season and Andujar had 27 homers and 47 doubles as a rookie big leaguer, so he’s answered questions about his power potential. Miggy was the rare underrated Yankees prospect. Benjamin asks: Thoughts on the 2001 AL Cy young award. Two names pop out, Roger Clemens (won), and Mike Mussina (5th). In your opinion, if this vote happened right now, would Roger still win? As far as I can see, Moose had the better stats in the AL, but didn’t have the magic W’s. Yeah, I think if we held the 2001 Cy Young vote today, Mussina would indeed win. Among those six he had the best park-adjusted ERA, allowed baserunners at the lowest rate, was second in the league in strikeouts (Hideo Nomo had 220 strikeouts for the Red Sox), and led the league in WAR by more than a full win. I remember Clemens went 20-1 in his first 30 starts that year and, at the time, sitting on a 20-1 record that late in the season made you a Cy Young lock. Mussina threw 8.1 more innings than Clemens and allowed seven fewer runs and 33 fewer baserunners. Brian asks: With unproductive final years of Texeira, A-Rod and (currently) Ellsbury contracts fresh in fans’ minds, the front office has fans right where they want us… many not clamoring for lengthy deals for Machado and Harper. You see right through that. Can you compare and contrast just the Ellsbury deal and why a Machado or Harper signing is advisable in spite of that debacle? Come on. Manny Machado and Bryce Harper are demonstrably better players than Jacoby Ellsbury was when the Yankee signed him. Ellsbury has batted at least 300 times in nine different seasons in his career, and in five of those nine seasons he was a below-average hitter after adjusting for ballpark. He had that truly excellent 2011 season that is so very clearly an outlier given the rest of his career. Only four times in his career has Ellsbury bested +2 WAR. Machado and Harper have done it six times each already. Also, the Yankees signed Ellsbury when he was 30. 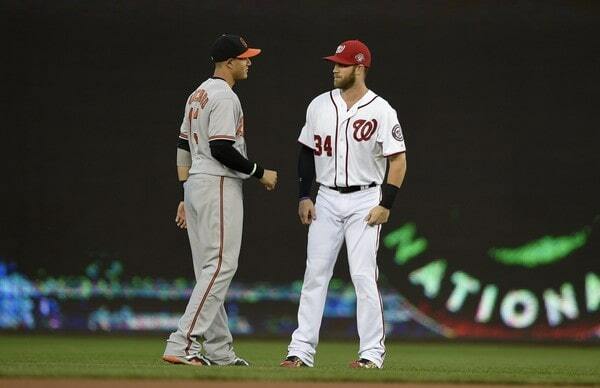 Machado and Harper are 26. Had Robinson Cano signed a ten-year deal when he was 26, it would’ve just ended and it would’ve been a smashing success. Ellsbury has had one (1) season on par with what Machado and Harper have done multiple times in their career. The first A-Rod contract is the best historical comparison here. That prime-aged proven star-caliber producer. Not Ellsbury. He was never on their level outside that one season. The “oh no a long-term contract” hysteria has jumped the shark. Eventually some team will sign Harper and another team will sign Machado, and those teams will be very happy they did, and every other team will look silly for not trying harder to sign them. When you’re where the Yankees are on the win curve, you have to worry about now now and later later. The oceans will probably swallow us all whole before these deals go bad. Emiliano asks: It is plausible to believe that Mariano could help Ottavino to improve his cutter like he did with Halladay or is it more about raw talent for the pitch? It’s possible, sure. It won’t be easy and it’s not guaranteed to happen, but it is possible. Just remember there’s more that goes into throwing a certain pitch than the grip. You need a certain level of laxity in your wrist to throw a curveball, for example. Pedro Martinez had such big hands and long fingers that he could really smother the ball when he threw a changeup. Not any pitchers could throw a changeup like Pedro. Rivera’s cutter was the result of a lot of things. The grip, his finger pressure, his arm action, etc. Adam Ottavino might not be able to replicate those things. Roy Halladay and David Robertson were able to after consulting with Rivera about his cutter, at least to some extent, so it is possible. My guess is there are more failure stories than success stories here. Michael asks: It appears that the Yankees 25 man roster will have the greatest range in jersey numbers possible this year at 99 (Ottavino at 0, Judge at 99). What was the greatest range in numbers previously? Keller played for the Yankees from 1939-49 and wore several different numbers. It wasn’t until he returned in 1952 that he wore No. 99. Keller had one plate appearance for the Yankees that year and Martin was the starting second baseman. Those two were atop the list for 67 years before Ottavino and Judge came along. Luis Cessa (No. 85) is the only other Yankee to ever wear a number higher than 77, and he never played with Jeter. The lowest number he’s ever played with is No. 11 (Brett Gardner). Ottavino and Judge will sit atop this list until the end of time. Put them on top, move everyone down a spot, then Ottavino and Cessa slot in at seventh place with a spread of 85, assuming Cessa remains with the Yankees and wears the same number. Brian asks: Would you rather Freddy Galvis 1 year 5 million or Tulo 1 year $500k? Galvis. The Yankees are over the luxury tax threshold, so the money is largely inconsequential at this point, and I think Galvis will be the better player this season. At the very least, you can bank on him being a very good defensive shortstop. He also has a chance to pop 15+ homers. I don’t know if Troy Tulowitzki can do either of those things. I get that he’s basically free and no risk, and the Yankees do have a good backup plan in DJ LeMahieu (with Gleyber Torres sliding to short), but I think Galvis is the better player and more likely to help the Yankees win games this season. Shrug. Zack asks: Given the way this free agency period is going, what do you think the chances are that Harper or Machado take a 3 year super high AAV (40+MM/year) deal that would expire a) before they turn 30, and b) after the current CBA expires which might result in teams being more willing to spend? I just can’t see it. If they’re willing to take a short-term contract, I think the more likely scenario is a five or six-year deal with an opt-out after year three. That allows them to hit free agency again at age 29 and right before the new Collective Bargaining Agreement takes effect, and also gives them a little insurance policy on the back-end in case things go wrong. A five or six-year deal with an opt-out after three years seems more likely to me than a straight three-year contract. Part of me wonders if Harper’s and Machado’s agents would push for an irregular opt-out date, say January 1st so they can better gauge the market and the impact of the new CBA. The CBA expires December 1st and the opt-out decision would normally be due in early November. Pushing the opt-out deadline back to January 1st — or even December 1st for that matter — would put them in better position to make an informed decision. We’ll see. Mark asks: What is your projected 25 man roster? 3 or 4 bench players? I feel like if everyone is healthy, it ends up being 4 bench players. You can’t really make Ellsbury do a 2 year rehabilitation stint…. can you? The Opening Day rotation order is whatever. No need to sweat it right now. I said earlier this week I expect Kahnle and Cessa to get the final two bullpen spots, which is why I have them in the table. Everything else is pretty straightforward. That last bench spot is the only mystery at this point. If Ellsbury is healthy, I imagine it’ll go to him. If not, it could be Greg Bird, Clint Frazier, or Tyler Wade. Those are really the only options, right? I’d be surprised if Thairo Estrada, Gio Urshela, or Billy Burns forced their way into an Opening Day. The best candidate for that open bench spot? Gardner. Sign Bryce Harper and move Gardner to the bench. Do it, Yankees. Deep down, you know you want to. Ten questions in this week’s mailbag. Just two more of these until pitchers and catchers report and Spring Training begins. Fun fun fun. Send your questions to RABmailbag (at) gmail (dot) com. Julian asks: Looks like Pettitte is going to fall off the HOF ballot in his first year. Do you think the lack of support is because of the PEDs or do writers really not think he’s worthy? Voters don’t think he had a Hall of Fame caliber career. Voters ran out of room on their ten-spot ballots. The human growth hormone admission. Performance-enhancing drug outrage is selective. Pettitte is well-liked and I don’t think the HGH admission will hurt him as much as, say, Manny Ramirez’s two suspensions. Derek Jeter is the only slam dunk Hall of Famer joining the ballot in the next two years, meaning voters will have more spots available for other players, and inevitably some of those spots will go to Pettitte. Enough to get him to 75%? Almost certainly not. It seems to me the biggest thing working against Pettitte is his lack of Hall of Fame numbers. He had a great career, no doubt, but Andy was more about longevity than top of the rotation dominance. Mike Mussina, an objectively better pitcher than Pettitte, received only 20.3% of the vote in his first year on the ballot. Pettitte coming in under that in his first year makes sense to me. My guess is Pettitte will gain support in the coming years but probably not enough to get into Cooperstown. Ross asks: Does Greg Bird have options left? and if so, how much time would he have to spend in the minors for an extra year of team control? Bird has all three minor league options remaining. The Yankees called him up in August 2015 and haven’t sent him down for anything other than a rehab assignment since, and rehab assignments do not count as an option. Bird has three years and 53 days of service time (3.053). There are 186 days in the season but only 172 days are needed to receive credit for a full year of service time. Keep a player in the minors at least 15 days and you buy that extra year of team control (186 – 172 = 14, then add one extra day). Add those 15 days to the 53 days of service time Bird already has and you get 68 days. That’s how long he has to stay in the minors to push his free agency back year. Two months plus one week, give or two. Seems worthwhile, no? Giving Bird ten weeks in the minors to show he’s back while Luke Voit gets ten weeks to show he’s legit seems believable. Teams are increasingly unapologetic about their service time manipulation. They don’t even try to hide it. In Bird’s case, sending him down would be justifiable, so it wouldn’t look that obvious. Rob asks: Which team do you think would be more effective over a season? A pitching staff made entirely of relievers that can pitch at least two innings a game or a staff full of starters that can go five innings each? The reliever staff. They’d rarely go through the lineup a second time and they would be able to air it out more than someone who has to pace himself for five innings. This is the where baseball is heading now, right? Using pitchers less and less to avoid the third (and sometimes second) time through the order penalty, and to allow them to go max effort. Short bursts are almost always more effective than pacing yourself for the long haul. Jeff asks: Dodgers shopping Joc Pederson, 3 years of team control, lefty power bat, can play left, could arguably hit well enough to break up Judge and Stanton, make sense for the Yankees to at least check in on the asking price? Worth checking in, for sure. Pederson’s done a great job cutting down on strikeouts and he’s a legitimate 25-homer lefty bat. The Yankees could use one of those. The downside is he needs a platoon partner (career 61 wRC+ vs. LHP) and he probably shouldn’t play center field any longer. I don’t know what the Dodgers are seeking in return (a reliever, maybe?) but, if the Yankees are not going to pursue Bryce Harper, Pederson would be a fine fallback plan. Mashes righties, two years of control, great clubhouse guy. The Yankees could stick him in left field against righties and move Brett Gardner to the bench. I’d rather the Yankees just sign Harper. Since that’s off the table, Pederson is a good alternative. He’s a quality player and the Yankees have room for him. 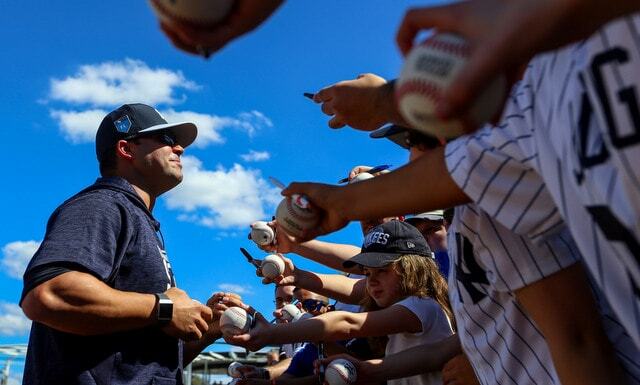 Alex asks: The Yankees have traded quite a few highly regarded prospects in the past few years (Rutherford, Mateo, Kaprelian, Fowler, Widener, Solak, Carroll, Tate, Sheffield, etc) which always causes some hand wringing; however, none of them seem to have particularly broken out. How do former Yankee prospects rank today? I would guess Widener or Sheffield lead the way? That’s not every prospect the Yankees have traded but it is the notables. Also, just to be clear, that’s how I’d rank them based on the players they are today, not the players they were when the Yankees traded them. Not counting Sheffield, Solak and Widener are the only players on that list who’ve raised their stock since the trade and neither is the type of prospect worth getting upset over. The Yankees have better infielders than Solak and a small army of Wideners in the system. They’ve done a good job picking which prospects to keep and which prospects to trade. Bill asks: MLB.com ranked Stowers as our #23 prospect right after the trade, and Long as Seattle’s #8 prospect. Given, our farm is better than Seattle’s, and Stowers would probably rank higher than 23rd in their system. It seems like we got a Good deal for Gray, then messed it up by immediately trading him for a lesser prospect to go with the draft pick. Would you agree? My preference would’ve been keeping Shed Long because he’s close to MLB ready and because, all other things being equal, the infielder is more valuable than the outfielder. It’s much easier to move an infielder to the outfield than vice versa. Moving to the infield, where the ball comes at you fast, is a tough adjustment for long-time outfielders. Very few have done it. Infield to outfield is the usual transition, not the other way around. MLB.com has not yet released their updated 2019 rankings, so I wouldn’t look at their lists to compare Long to Stowers. Before the trade Baseball America (subs. req’d) ranked Stowers as the tenth best prospect in Seattle’s system. Now they rank Long ninth. The difference between the ninth and tenth best prospect in a farm system is nothing. It’s a matter of personal preference at that point. Based on Baseball America’s 2019 rankings, it was a fair value trade. Long and Stowers are similarly ranked. Ross asks: If you were going to build an 8-man bullpen, and could use all relievers in the AL East to do it, who would be in that bullpen? I assumed Cessa and Kahnle will get the final two bullpen spots and, for the other AL East teams, all I did was pick the top eight relievers by projected WAR. (There are a bunch of dudes at +0.3 WAR. I just grabbed three.) According to Steamer, the Yankees have the two best and four of the seven best relievers in the division. Seems good. Andrew asks: I have three questions related to draft pick the Yanks got for Gray. 1) ESPN says the pick is worth about 10 Million dollars. Do you agree? 2) Would the Yanks lose this pick if they signed Harper? It would be their 2nd highest pick. 3) If the Yanks lose the pick, would they also lose the slot money? Let’s go one by one. 1) Right now the pick in the Sonny Gray trade sits at No. 36 overall. It could still move a little bit as the last few qualified free agents sign. Matt Murphy’s research a few years ago found the 36th pick is worth about $18.6M, which is quite a bit more than the ESPN number. That $18.6M seems awfully high to me, but who am I to argue? 2) Yes, the Gray pick is the pick they’d lose to sign Harper or any other qualified free agent. 3) Yes, they’d lose the slot money if they forfeit that pick to sign a free agent. That pick and the bonus money would just disappear if the Yankees sign a qualified free agent. It doesn’t go to the team that lost the free agent like the old days. Judge won’t make the youngest players list, obviously. He didn’t play his first full big league season until age 25. He has a very real chance to hit 100 homers in fewer games than anyone except Ryan Howard though. Can he hit 17 homers in 30 games to break Howard’s record? Probably not, but the fact it’s not completely impossible is pretty insane. 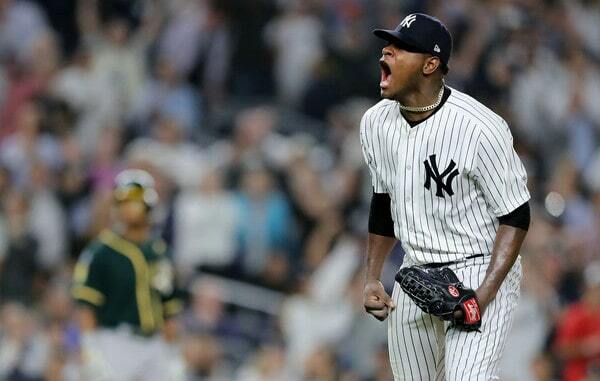 Andrew asks: When can the Yanks put Didi and Jordan Montgomery on the 60-Day, to open up a couple of 40-man spots? I would think the Yanks would want to put them on there as soon as they can. I’m not sure about the exact date and it seems to move around each year. I think it might be the mandatory reporting date per the Collective Bargaining Agreement, the day everyone has to be in camp. It’s sometime in late-February. (Teams set their individual reporting dates well in advance of the mandatory reporting date.) I know the disabled list day is early in Spring Training, before Cactus League and Grapefruit League games begin. Two things to keep in mind about the 60-day DL. One, teams can only use it when they need a 40-man roster spot. Someone has to be added to the 40-man roster right away whenever the Yankees put Didi Gregorius or Jordan Montgomery on the 60-day DL. And two, the 60-day DL isn’t retroactive in Spring Training. Put a player on the 60-day DL at any point in the spring and he has to miss the first 60 days of the regular season. That’s something that has to be considered. If the Yankees think Gregorius could return in May, they might not 60-day DL him. There are a dozen questions in this week’s mailbag. Only four more mailbags after this one until pitchers and catchers report to Spring Training. Anyway, RABmailbag (at) gmail (dot) com is the mailbag email address. Send all your questions there. Steve asks: How about Frazier learning 1B in Spring Training? My guess is that his power would translate, he’d be significantly less likely to repeat concussions and the position is open. It’s possible. Two things about this though. One, I think the priority in Spring Training will be making sure Clint Frazier is healthy and on the path back to being a productive player following last year’s concussion issues. He missed a lot of time last season and has not yet been cleared to work out on a field. (That should happen soon.) He’s hitting in the cage and playing catch. That’s about it. Asking him to learn a new position while coming back from such a long layoff might not be the best idea. And two, there is an opening in the outfield for Frazier. I don’t think the Yankees will let Brett Gardner stand in the way should Frazier show he’s a better option. The Yankees reduced Gardner’s role down the stretch last year once Andrew McCutchen arrived. I think they’d do it again if Frazier comes back well and show he’s ready to help. My hunch is the Yankees hope Frazier is at least platooning with Gardner at midseason and ready to take over left field full-time in 2020. Learning first base is possible, sure. I see reasons why the Yankees might not do it though. Kara asks: Are teams allowed to add non-salary incentives to free agent contracts (say: housing or transportation perks) or is that against the CBA rules? I wonder because it seems that such extra-salary benefits might have a particular allure in a city like New York where a there’s so much exceptional real-estate that a really beautiful/desirable apartment or house might be a true lure. Yep. Teams do it all the time. Well, not all the time, but often enough. Masahiro Tanaka’s contract includes allowances for housing ($100,000 per year) and a full-time interpreter ($85,000 per year). He also received a moving allowance ($35,000) and four first class round trip tickets between Japan and New York. A.J. Burnett’s contract with the Blue Jays included eight round trip limo rides from his home in Maryland to Toronto (because his wife hates flying). Carlos Beltran’s contract with the Mets included a high-tech tennis ball launcher. Alex Rodriguez’s contract with the Rangers included a $150,000 bonus for being named ALDS MVP, which doesn’t exist. There are a lot of weird contact perks out there. Remember though, teams are cheap as hell, and they don’t like giving these perks out. Alberto asks: Between Bryce Harper & Giancarlo Stanton who had the better 2018 season? We know Stanton had 38 HR to Harper’s 34 & both had 100 RBI, but beside that who had it better? Ben Lindbergh and Mike Petriello examined Harper’s defense and found there were times Harper appeared to employ some self-preservation. He didn’t dive and he didn’t run into walls, resulting in more balls falling in for hits. Given his injury history and impending free agent payday, I can’t blame him. Don’t be surprised if Harper’s defensive numbers bounce back this season. Matt asks: Stupid question(s): why does the ~$15M for benefits count towards the Luxury Tax? Other than because it hasn’t been collectively bargained, why can’t they still make that a mandatory payment but not count towards the tax? Because it’s another way for owners to limit player spending. That’s all. Last year each team paid $14,044,600 toward benefits and it counts against the luxury tax payroll. That $197M luxury tax threshold last season was actually a $182,955,400 luxury tax threshold for player contracts. We don’t know the 2019 benefits figure yet (probably around $15M), but yeah, the $206M luxury tax threshold will actually be something like a $191M threshold for player contracts. This is one of those things the MLBPA should push to get changed in the next Collective Bargaining Agreement. Each team pays an equal amount into benefits and it is mandatory. Get that out of the luxury tax payroll calculation. Eric asks: Is signing Hunter Strickland a possibility for the Yankees? The Yankees need another reliever and he seems like a bounce-back candidate. Could be, sure. Strickland is kind of a hothead — he broke his pitching hand punching a wall last season and missed two months, plus there’s the absurd two-year grudge against Bryce Harper — and I don’t know if the Yankees will go for that, but yeah, he could be a lower cost bullpen target. Last season he had a 3.97 ERA (4.42 FIP) with 18.4% strikeouts and 10.5% walks in 45.1 innings around the hand injury. It was easily his worst season as a big leaguer. Strickland turned 30 in September and he has a career 2.91 ERA (3.40 FIP) with 22.6% strikeouts and 8.5% walks. His fastball velocity (95.0 mph) and spin rate (2,392 rpm) were quite good last year and you know the Yankees will love that. The Yankees are big on makeup and accountability. A dude who missed two months because he punched a wall might not be their cup of tea. Julian asks: With the first base situation still a question mark, should the Yankees consider trading for Encarnacion? I’m inclined to say no. For starters, Edwin Encarnacion is more of a DH than a first baseman. He’s started only 55 games at first base the last two years. Secondly, he is starting to show signs of decline at age 36. Encarnacion hit .246/.336/.474 (115 wRC+) with 32 home runs last year, which is obviously very good, but is a far cry from his heyday with the Blue Jays. He posted his worst strikeout (22.8%), walk (10.9%), ISO (.228), and wRC+ (115) marks in eight years last season. Chances are he’s only going to perform worse from here on out, especially if you’re asking him to play the field on an everyday basis. And third, Encarnacion has $25M coming to him next season and his contract comes with a $20M luxury tax hit. Even if the Mariners eat some money, which I assume they’re willing to do, that’s a lot of scratch. Trading for old and declining Encarnacion is an old Yankees move. Keane asks: Johnny Damon was 231 hits away from 3000, which is about a season and half for him. He fell off the ballot in the first year, do you think the BBWAA underrated him? I don’t think so. Damon was obviously a great player but he is a clear cut Hall of Very Good player to me. Career .284/.352/.433 (105 wRC+) hitter with good counting stats (2,769 hits, 235 homers, 408 steals) and +44.2 WAR. That’s really good but it’s not Hall of Fame good. Only two All-Star Game selections (for real) and never finished higher than 13th in the MVP voting. Was Damon ever even the best player on his own team? I don’t think so. As good as he was, Damon never struck me as a Hall of Famer or even as one of the very best players in the league, which is kind of a prerequisite for Cooperstown. There’s nothing wrong with being a compiler. Damon had a great career, won a couple World Series titles, made a ton of money. Not a bad career at all. Ray asks: Ray asks: While the Yanks should sign Harper and Machado I don’t expect they will. But given Dombrowski’s comments about Kimbrel, what are the chances his price drops to the point the Yankees pounce? 4 years/$68M with opt outs? That would be some relief corp.
Red Sox GM Dave Dombrowski recently told Bob Nightengale he doesn’t expect to spend much on a closer. “Craig did a great job for us, he’s a Hall of Fame reliever, but we have not anticipated having a large expenditure for a closer,” he said. Cot’s has the Red Sox with a $240M payroll for luxury tax purposes, so they’re $6M under the $246M third luxury tax tier that triggers the harshest penalties. They have some big contract decisions coming soon. Chris Sale, Xander Bogaerts, and J.D. Martinez (opt-out) will be free agents next winter, then Mookie Betts a year later. We’ll see what happens. I’m not sure Kimbrel will get $17M a year like Aroldis Chapman, Wade Davis, and Kenley Jansen. That’s what he would’ve received in the old wild west days of two winters ago. Now? I’m not sure he gets more than $15M annually. I think his asking price would have to drop into Zach Britton territory for the Yankees to consider signing him. Something like three years and $13M to per season. I can’t see them carrying two relievers at $15M+ per season and even three at $10M+ per season seems unrealistic. I think the Yankees would sooner sign Adam Ottavino for two years and $22M or so than Kimbrel at his price, even if it drops. Hard for me to see a scenario in which the club spends for Kimbrel. Brent asks: I know that Sonny Gray is probably the best sixth starter in baseball and there’s a case to be made for keeping him but if the Yankees will still move him and SDP are interested they should go for it. I know mtps but Gray for Josh Naylor just seems pretty great. Naylor should go to AAA and possibly help this year at 1b if not next. He’s a lefty and his swing reminds me of Papi a bit. Do you think gray would be enough to get him? Not sure he could cut it in the of and is kind of blocked by hosmer, no dh. What do you think? Naylor can hit. He put up a .297/.383/.447 (128 wRC+) batting line with 17 homers and nearly as may walks (11.1%) as strikeouts (12.0%) in 128 Double-A games last year, and he spent half the season as a 20-year-old. Naylor is a terrible defender and he’s slow as hell — dude’s listed at 5-foot-11 and 250 lbs. — but he can hit. I see him as a better version of Dan Vogelbach, another big lefty DH prospect, and those dudes seem to get overrated quick. I’d like the Yankees to exhaust all other trade opportunities with Sonny Gray before settling for someone like Naylor. There’s nothing here besides the bat, so if he doesn’t hit, he’s worthless. Try for a more well-rounded prospect or some arms. If Naylor is the best the Yankees can do, take it. I’d like to think there’s something better out there. Chris asks (short version): After reading the Domingo German fourth option post, could Gray have been sent down to Scranton? And would that have been a better solution than having him rot in the pen, or would that have diminished his value even more than sending him to the pen and saying we needed to trade him has degraded his value? Finally are you saying that Paxton still has an option? Yes, the Yankees could’ve sent Sonny Gray to Triple-A last season. Remember though, they were short on starters until the trade deadline, and sending him down was never all that realistic. German was already in the rotation and Luis Cessa was making regular spot starts to give everyone extra rest. By time the trade deadline rolled around and the Yankees imported Lance Lynn and J.A. Happ, Gray reached five full years of service time and could’ve refused a demotion to Triple-A, which he would’ve done because everyone in his situation would do that. Sonny’s first relief appearance came on August 7th. It was too late to send him down by then. As for James Paxton, yes, he has an option. Two, in fact, and he doesn’t have five full years of service time, so the Yankees can send him down this season. They don’t want to do that though. It means something terrible will have happened. Chris asks: Hey, so I saw your thoughts on a deadline to free agency, and agree 100%. What do you think of reducing the number of years of team control to try and encourage more signings of free agents to replace them? Failing that, do you have any thoughts on potential solutions? Letting players qualify for free agency after four or five years rather than six could work. I keep coming back to this though: Manny Machado and Bryce Harper are two 26-year-old superstars and they’re having trouble finding work. How much will reducing the number of years of team control really help? Teams will just continue to look for younger and cheaper players, and they’ll just have to do so more aggressively. The single best thing the MLBPA could do going forward is increase salaries for players with 0-3 years of service time. Raise the league minimum to $1M, lower the service time requirement for arbitration, whatever. Baseball’s economics are completely backwards. Players are most productive early in their careers and that’s when they’re paid the least. Keith asks: What’s the plan if Tulo gets hurt or just can’t cut it in Spring Training or April? Beats me. If Troy Tulowitzki simply has a bad Spring Training, I don’t think it’ll matter much. The Yankees will stick with him at shortstop going into the regular season. Remember Raul Ibanez? He was awful in Spring Training and everyone was wondering what the Yankees would do with him. They stuck with him and were rewarded. I imagine they’ll do the same with Tulowitzki. He’s had a long layoff and I imagine it’ll take him some time in Spring Training to get back up to speed. It’s only fair to give him a couple dozen at-bats before seriously evaluating him. Now, if Tulowitzki gets hurt in camp, then the Yankees could be in trouble. Tyler Wade and Hanser Alberto will be around as replacements, and I have to think there will still be some free agents sitting on the open market. And there is always a rush of minor trades at the end of March as teams finalize their rosters and figure out what to do with their out-of-options players. None of those are good options, mind you, but those are the options. Either go with Wade or Alberto, or scour the scrap heap.